An end of August into September treat with Bramley or similar tart cooking apples. Or in October, November or anytime for that matter. 3 large Bramley apples or similar cooking apples, peeled, cores removed, and each apple cut into 0.5cm/¼in slices. 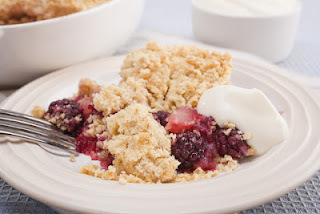 Make the crumble topping in a food process by mixing the flour, butter and sugar until the mixture looks like breadcrumbs. Or you can sift the flour into a large mixing bowl. Add the butter and sugar and rub together with your hands to the right texture. Grease with butter an oval 23cm/9in ovenproof dish (or slightly larger if you have one) and layer in the sliced apple and add the blackberries. Cover with the topping mixture. Press the topping firmly down on the filling with the palm of your hand. Put the dish in the oven and bake for 40 minutes, or until the topping is browning and the filling is bubbling. You’ll probably want to serve it with cream, or ice cream, crème fraiche or crème anglais.